We went with some friends who got spot R and setup their tents and somehow it was double booked and they ended up kicking us off even though we were setup on there already. Odd situation. We have a 35 foot "pull through" and it was a wierd pull through because of the way the center landscaping was. I ended up actually having to back out because the turn area wasn't large enough. Wierd setup. I'd camp there again but probably in a different spot. Campground had the sound of motorcycle idiots all day on the road outside. Love being near the creek though. We would camp there again. We camped at Vogel State Park in a Motorhome. Coopers creek WMA nearby and is a great jeep trail and fishing. This place was great. One of my favorites and I don't even like the beach. 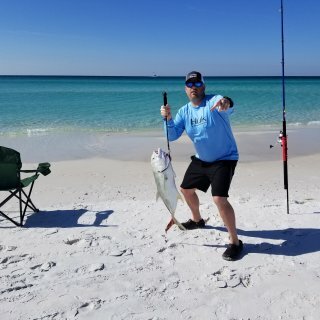 Destin has literally change my opinion on the beach as I am a mountains guy. The campground was clean, you felt private even though you were next to everything. 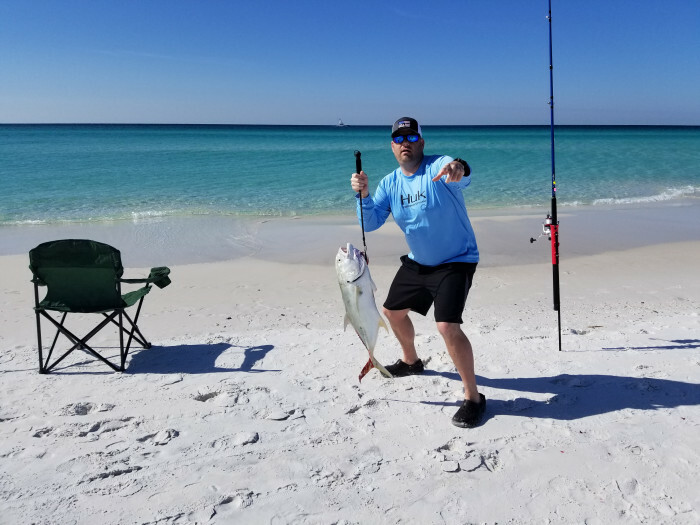 Obviously the fishing was great, we tagged out twice on our limit. Multiple great restaurants in walking distance. We had the beach to ourselves multiple times. We will probably be back on a yearly basis. I loved this place! Front office staff nice. The rum I brought was great. Just a great overall campground. I just wish the walk was a little closer from the C and D loops!! We camped at Henderson Beach State Park in a Motorhome. Love this place. It feels private but you are in the heart of Destin. We walked down the beach to multiple restaurants. Beach walk cafe was amazing. Camillas was great. This review is the tale of two extremes.. On one hand you have the site itself. Simply put, it was the worst most expensive site we have ever camped in. Roads in and out of sites are too small, everything is tight, small little brown site markers are easy to hit because you can't see them. You can tell they get bumped regularly. Site is bad too, pad was too small, we fit our 35 foot motorhome but just barely. Connections are weird too; power is located all the way in the back, which makes you either extend your power cable all the way or back into your patio area which some people did. Behind our site downed trees, and mud/swamp area. Last, no fire pit which to me is unacceptable we enjoy having our fire and relaxing at night. Lastly the cable TV connection didn't work, which was very frustrating again when you charge a premium I expect a premium... I was very very disappointed in our site. It was twice the price, for half the site than we had everywhere else this past year. Now the good, the campground itself is amazing. Facilities all very clean, bus service to get around the campground and to the parks. Fantastic buffet in the restaurant. Nice pool area. We watched the magic kingdom fireworks from the dock. Great campground facilities, terrible site. We camped at Disney's Fort Wilderness Resort & Campground in a Motorhome. We stayed the night so it was a quick stop for us on our way to grand lake. Overall it was good, clean, and everyone was friendly. They had a steel drum band which was cool, but weird at the same time. Pancake breakfast was a good deal and we were on our way. 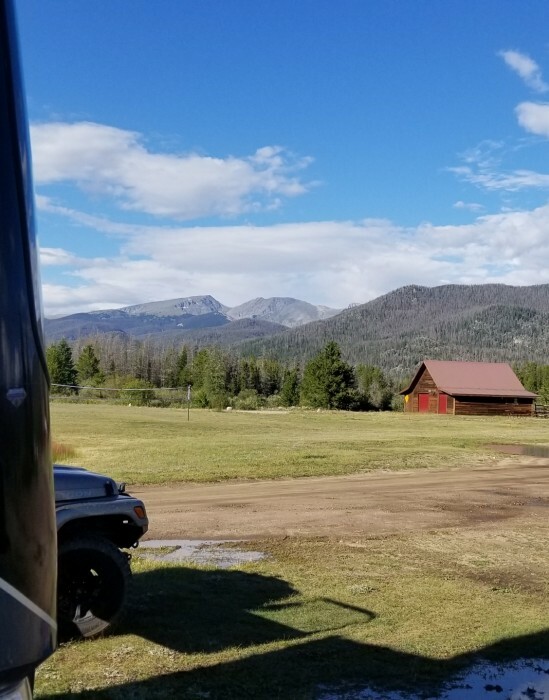 We camped at Denver East / Strasburg KOA in a Motorhome. Amazing, simply amazing. The resort is fantastic all around. Spots were large enough for everything. The view was simply amazing, first time this east coaster ever got to see the milky way at night. We were setup across from the ATV rentals and thought it might be a noise issue but it didn't bother us at all. 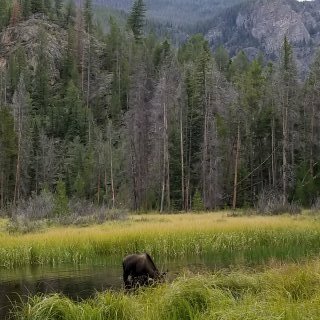 We had moose cruising through camp daily to include a momma and her baby. We did the horseback riding too. We took the 2 hour trip with and had a fantastic time! Guide was amazing too, tons of great stories! Can't recommend this place enough! We camped at Winding River RV Resort in a Motorhome. The Colorado river is right across from the entrance of the park has a nice trail and we fly fished almost every day and caught a ton of little brook trout. 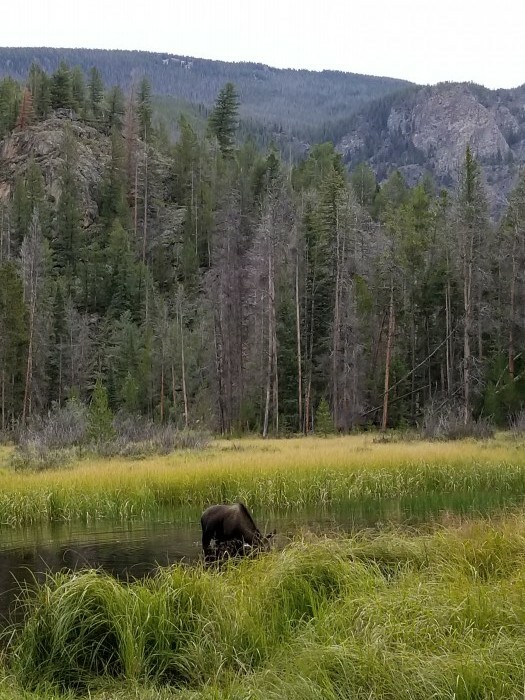 Rocky Mountain National Park is really close by. Don't miss Trail Ridge road and Old Fall River road on the way back. Don't be shy about taking Fall River road; we saw a mini van make it through, so your vehicle can too!! East Inlet Trail in Grand Lake is one of the nicest trails I've ever been on. Wife and I stayed here on our way back from Colorado to Atlanta. Campground was clean and we felt the inside store/grill area was also very clean. Owners are obviously very engaged and present in the business and it shows. Clean throughout, we enjoyed a movie night at the pool. Hot tub available as well (god bless the folks in the hot tub in the hot Tennessee summer I would of passed out). We got breakfast in the morning in the little grill area and it was enough to get us going. What I didn't like was how close the sites were. I just felt like people where right there on top of you and were to close. If I was the owner I would of done the same thing to maximize profit, but as a camper i just want more room. We live in Atlanta and will be going back here again when we want a weekend trip into Nashville. They run a shuttle every day to broadway and other areas why makes it so you almost don't need a vehicle. Overall good place to stay for a trip to nashville. We camped at Nashville KOA in a Motorhome. Take the shuttle to all the sights! Overall we enjoyed this park. We thought it was a little on the pricy side but would stay again. Wifi reception was good, cell service was good. The workers were very active always driving around and always available to help. Really nice folks running this campground here. We had a water lot which is really just a little swath and did some fishing. My only complaint was we got woken up one morning at 7am by work trucks building their new little RV area. I wish they would of waited until 8 or so that wednesday morning. We heard around the campground multiple really positive comments about the owners of this campground. They really seem to care and want to take care of people. I really like the owners/staff here. We camped at Myrtle Beach KOA in a Motorhome. We found the area around the KOA near the water to be less than desirable. The boardwalk area is ok. Multiple piers closeby for a nice walk. We also went to Broadway by the beach and Market common for dinner (couple of great craft beer places in the common area. 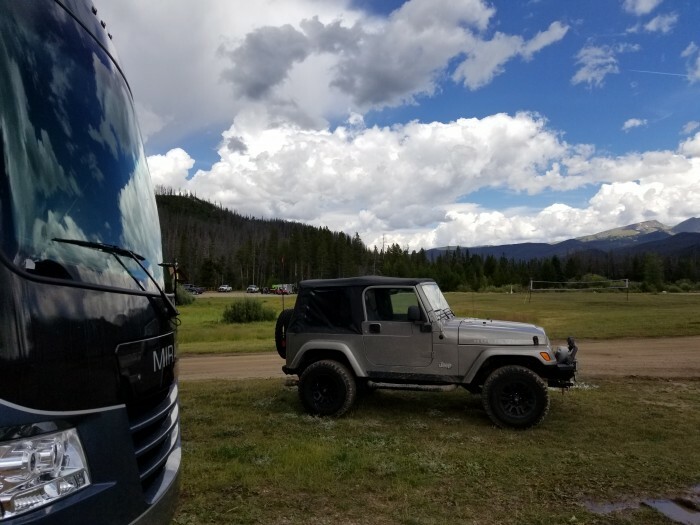 This campground is a great mix between mountains and lake. Nearby small towns are fantastic. They have plenty of room for disconnecting the toad. A million events throughout the year. 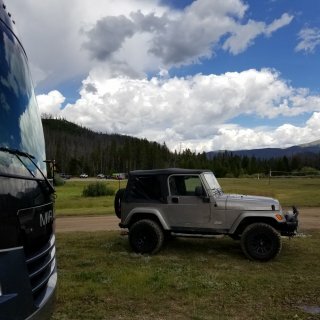 Our site was on the water and it was one of the prettiest views we have had from a campground ever. Power, water, and sewer all were uneventful. We really enjoyed ourselves and have already booked another get away here. We camped at Georgia Mountain Fair Campground in a Motorhome. Lots of great small shops and farmers markets close by. Head to the top of bell mountain. Lots of great jeep trails around too! Stayed here over a weekend and really enjoyed it. Check in was easy although not great "quick" parking to unhook the toad while checking in. Sites and streets were a little tight but doable. Overall we had a great experience. The visitor center closes at 6, we were 5 minutes late to it. Looks like they have some cool zip line things but not sure they were open. Campground had good power, water and sewer. Overall a great value and a great location we will be back. Lots to do in the area as well. The folks working the campground really seemed to care, and checked in to make sure everything was good! We camped at Unicoi State Park and Lodge in a Motorhome. Fishing in smith creek was great. Town of Helen close by for food and other things. Betty's general store is awesome!! The campground here is nice. Had everything we needed for a good stay. Owners were great and were very friendly and helpful. Everything worked as expected. We would stay here again if we decide to go back to the area. We camped at Anderson / Lake Hartwell KOA in a Travel Trailer. Other than the lake really not much going on in this area which is why we likely won't be back. We stayed here for a long weekend. Overall I wanted to like it, and we will go back however I was disappointed in 2 things. First and most importantly site 5 is terrible, horrendous, worst site on the entire campground, honestly just remove it. Where to start, first it's right outside the front door of the store so the traffic, and noise, and music from the pool area is endless. Everyone in the campground cuts through the site to get to the store, so there is an endless line of people just parading through your camp. During our stay our firewood, and our neighbors got stolen. In the mornings the slamming of car doors, and the smell of the diesel trucks idling 20 feet from your rv while they get firewood, ice, and go inside the store will wake you up. In the evening you get people pulling up at all hours and the doors constantly going. The sewer hookup you can't screw into at all, its coming out of the ground at a 45 degree angle and it ends up being much higher than your hose because of how much it's above the ground and angled so its tough to drain out completely. Overall just a terrible, terrible site. Our first night there we tried to buy firewood and one of the employees (who obviously didn't want to work) refused to sell us any, said there was a ban in the county. There was 5 people within a stones throw with a fire and people had fires all weekend. The next day the same guy was selling other people firewood??? I will probably be back, I liked the location, and the grounds we just got a really bad spot this time, but if we have issues like this again no more for us. We camped at Cherokee / Great Smokies KOA in a Travel Trailer. Spots 1-6 are not good.. Avoid. Overall the campsite was good, and the front desk folks were efficient and friendly. The only bad thing was the over zealous park rangers with alcohol. We didn't have any issues but most of the other folks in our little area did and honestly it was just too much, following people, hiding in the woods and spying. It's all confirmed. Unless someone is a problem leave it alone. We camped at Shady Grove Park in a Travel Trailer. They do have kayaks and canoes to rent during the main season. Overall the stay was good, except for the rude and condescending behaviour to multiple people. I ended up hearing about other people having similar issues while on site. 30amp service worked, but my surge protector showed that the polarity was reversed. Might be an issue. There is one dump site. Worked well, except for it being a monsoon. Water really collect in the dump area and it's hard to keep it all stable while trying to unload. Our spot was great with a gorgeous view of the lake, near a beach where we were able to beach our boat. Really close to Atlanta and great for a weekend get away. Lady doing check in just needs an attitude adjustment. 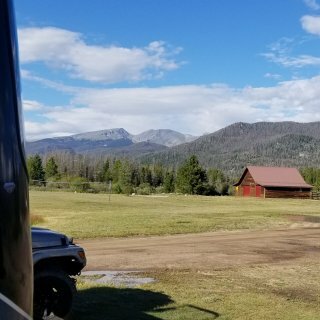 We camped at Sawnee COE in a Travel Trailer.